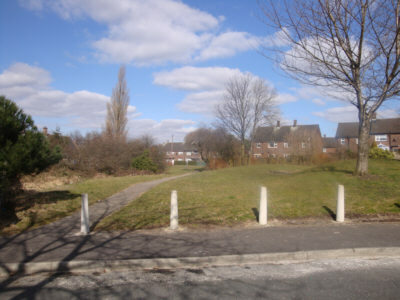 Cutler Hill can be reached by bus from Oldham or Manchester to the junction of Ashton Road East and Westminster Road. The canal at Cutler Hill had been in water for some time as it had been used to store water for mills in Hollinwood, such as Mersey Mill and Albert Mill, which did not have theri own mill "lodges". 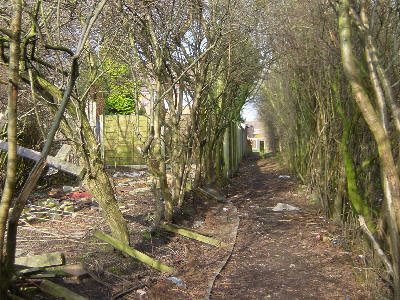 The route of the canal north of the bridge runs parallel to Westminster Road and now takes the form of a narrow path running through an area of trees. Looking back to the site of the demolished Cutler Hill bridge and Bay Horse Inn. 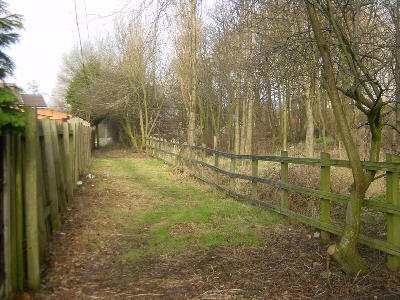 Looking towards Hollinwood, the infilled canal line continues behind houses. The infilled canal, looking south near Landsberg Road. 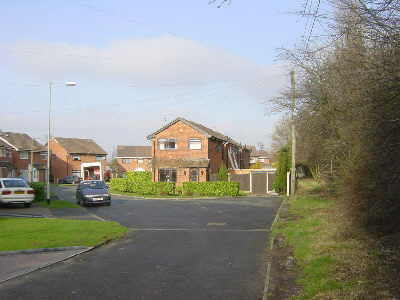 Houses have been built on the line of the canal ahead, but the land to the right could provide a suitable alternative route. If you are walking the canal route, about 300 metres north of Cutler Hill you will need to bear slightly right and go along the track shown in the picture. Keep walking straight ahead, with the houses to your left, until you reach Roman Road at the junction with Hillingdon Close. Follow the path to the right of the houses. 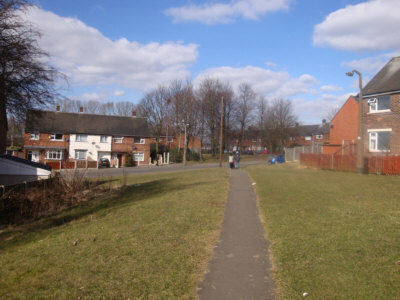 Path between houses and school grounds. The original canal route crossed Roman Road at Street Bridge at this spot. 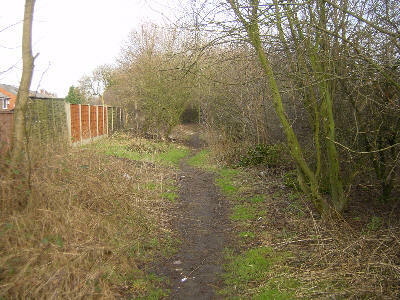 Area where a possible new route could cross Roman Road, a short distance east of the original alignment. Roman Road was at one time known as "The Street" (hence "Street Bridge") and formed part of the Roman route between Manchester and York. 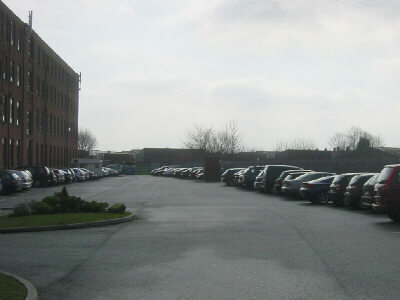 To the north of Roman Road, industrial premises have been constructed on the original canal route. 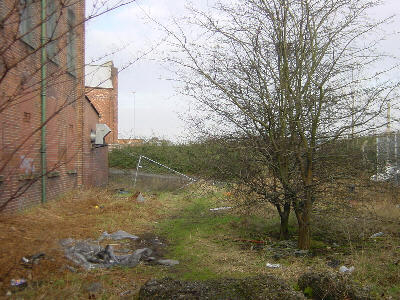 However, to the east of Albert Street is a large open area proposed for development. Not only would it be possible for a new canal route here, but there is potential for canal-related development, such as a marina, in the area. 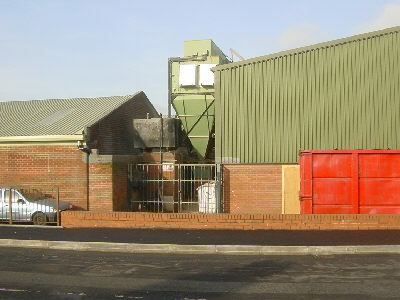 Industrial buildings have been erected on the canal line to the north of Roman Road. 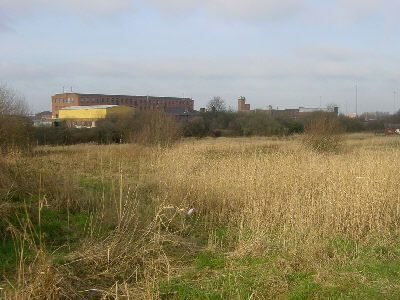 Open land to the north of Roman Road, between Albert Street and the motorway. The original canal route curved round behind Albert Mill, shown on the left of the picture. If you are walking the canal route, turn left onto Roman Road, then immediately right along Albert Street. 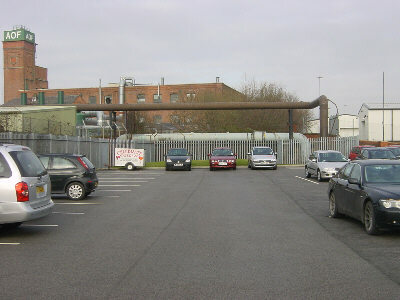 The old gasworks footbridge can be seen behind the mill car park on the left before the road climbs to the roundabout. 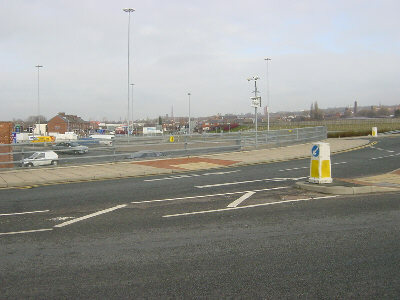 At the roundabout, turn left onto Hollins Road, then left onto the A62. There are buses from here to Manchester and Oldham. 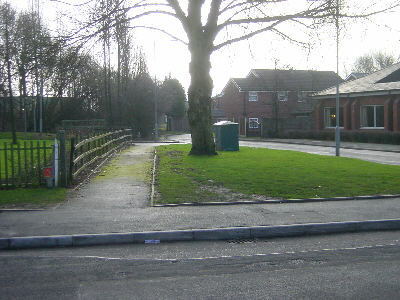 The cobbled approach to the footbridge which crossed the canal, linking the two parts of the former Hollinwood gas works. 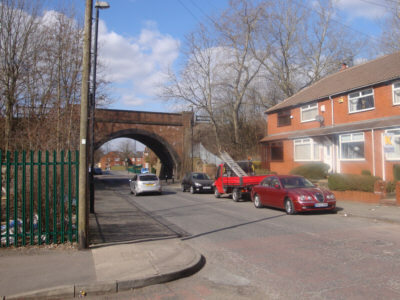 View of the iron bridge in Hollinwood from the north. The towpath was on the far side. Trees growing on the line of the canal. 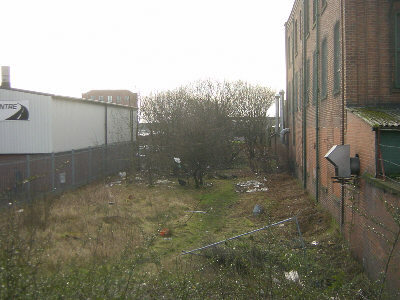 Looking south from Hollins Road - the canal line between the buildings is obvious, but could not form part of any future through route, as the next picture shows. 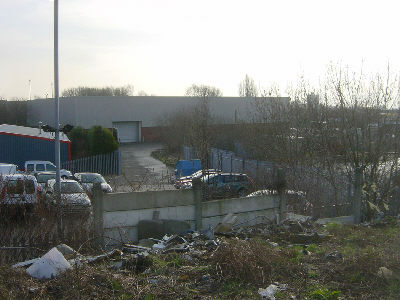 Looking north from the re-aligned Hollins Road, towards the site of the former Bradley Bent Basin, now consumed by a motorway cutting beyond the car park. Bradley Bent Basin was to the north of Hollins Road. It had a wharf on each side and a short loading arm leading eastwards. 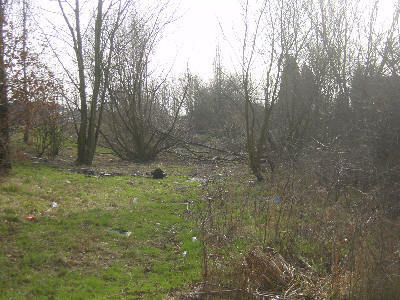 The site of the basin has now disappeared as part of the cutting where the M60 motorway rips through Hollinwood. From Bradley Bent Basin, the canal climbed a further four locks to its summit level. Before the two top locks, the canal passed under the A62 Manchester Road by way of a long skew bridge at an angle of about 45 degrees. 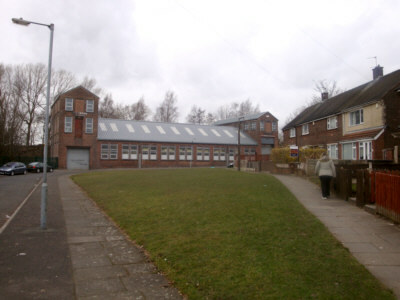 There was a storage reservoir to the east, between Manchester Road and Chapel Road. After the seventh lock there was a wide basin with a loading wharf that ran alongside Manchester Road. This was known as the Timber Wharf although cotton was also unloaded there. Above the eighth lock was a junction, with an arm leading back to Manchester Road, running parallel with Wharf Street. On this arm was the wharf where coal was loaded that arrived from Chamber and Copster Hill Collieries by tram road. 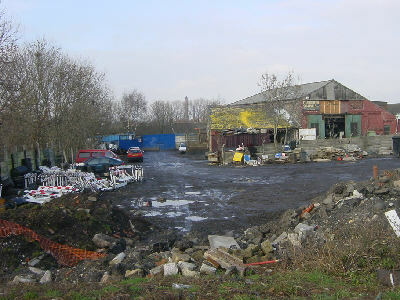 To the north of the junction was Hardmans boatyard, where boats on the canal went for repairs. Only one of the canalside buildings still survives (see picture below). The whole area between Drury Lane and Wharf Street had been a hive of industry, with lime kilns, a smithy, and factories making "colliery implements" in addition to the canal activity. Looking south-east from the site of the top lock, close to Canal Street. The canal ran towards the middle of the picture, then curved away to the seventh lock, which was to the right of the new building, just before Manchester Road. To the left of the picture was a wide basin and loading wharf. Looking north-west across the site of the top lock (No. 26). Beyond the lock, an arm with coal wharves branched off to the right, heading back to Manchester Road. 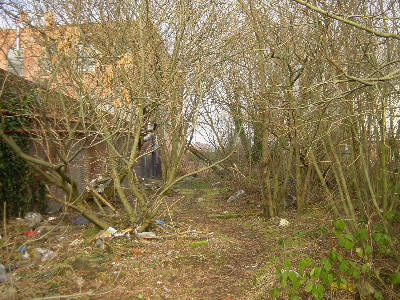 A tram road ran from the wharf to Copster Hill Colliery. The Werneth Canal extension continued straight ahead. Graham Lison's workshop near Wharf Street. The gable wall on the left of the building was on the edge of the canal. To the right of the building was a boatyard and wharf. The arm serving the coal wharves went off to the right, where there was also a dry dock. 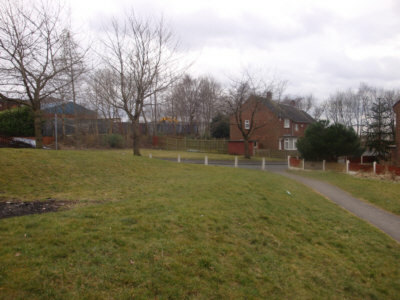 The canal to the left continued into the private Werneth Canal. 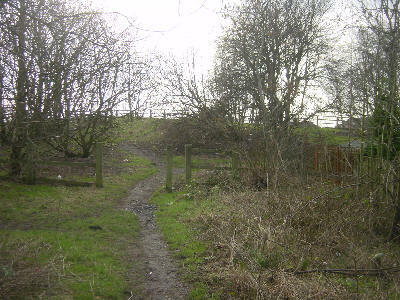 The route of the Werneth Canal continued from the top lock, towards Washbrook, curving round the hillside to the New Engine Colliery at Old Lane. This section of canal closed when the Washbrook railway embankment was constructed. Although long-gone, the waterway is remembered by the names Canal Street and Wharf Street. At the top lock, the canal straight ahead continued as the privately-built Werneth Canal. This was about half a mile long and was built by the Werneth Collieries. This was because short private branches could be built without the Acts of Parliament normally needed for canal construction. 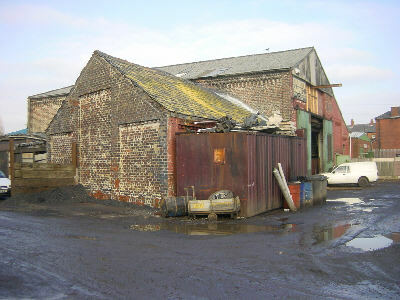 Looking back across Wharf Street, the roof of Graham Lison's workshop is visible on the left. 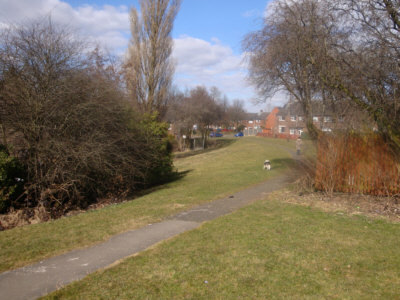 The path and green strip follow the route of the Werneth Canal as it contours around the hillside. 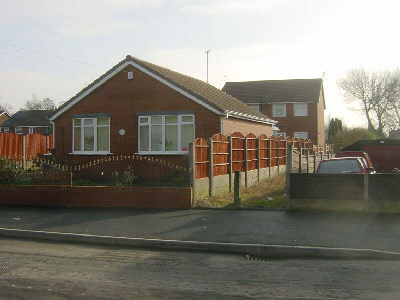 ...and across the corner of Raymond Avenue. 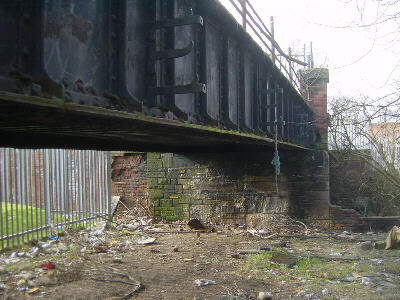 The present-day Stanley Road crosses the line of the canal where the railway bridge now is. The line of the canal is then underneath the railway embankment until curving to the right to a terminal basin next to the present Whiteley Street. The route curved round to Washbrook and then eastwards towards Old Lane, meeting a tram road bringing coal down the hill from Werneth's pits. 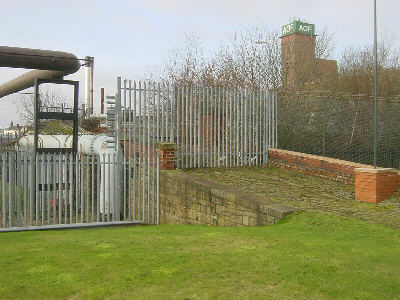 The New Engine Colliery was later built close to the canal head. By the time the railway was built in 1875, these pits were no longer producing coal and Werneth Canal was no longer in use. The high railway embankment to the east of Washbrook obliterated this part of the canal.